I know they don’t look like much. Two naked bottles. Label-less. Foil-less. Cheap glass. No carefully crafted story on their backsides. Yes, I’ll admit it. I am someone who indulges in excessive sentimentality. And even though the act of sentimentalization can be thought of as a burden to some…I see it as a tool for capturing and preserving things in my past. Now for me, there is certainly something to be said about the experience of a wine and the sentimentality I attach to it. Often it is the circumstance under which the wine was enjoyed that causes it to embrace my memory. I am often left wondering if it was the wine that was good or was it the time, the place and the people that made it so special. Well, for these naked, label-less wines, they are my first. 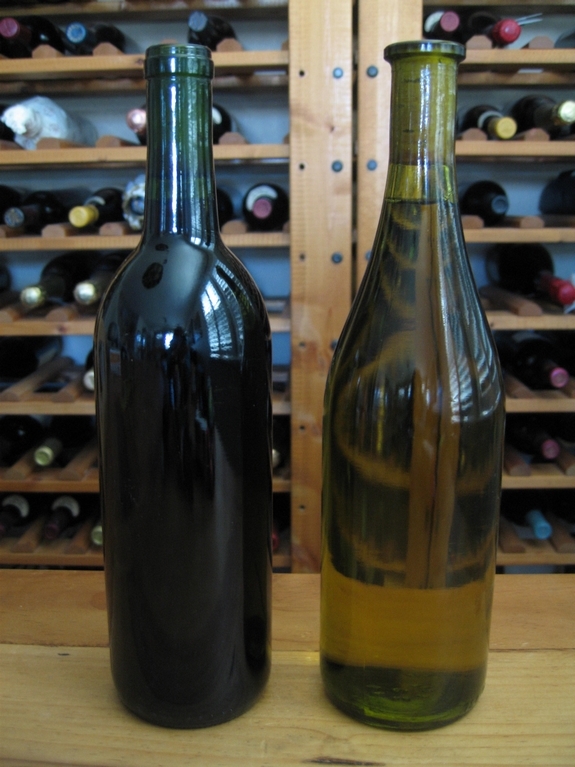 The first wines made by me (and many of my dear classmates) that were preserved under bottling conditions. These wines are my reminder of why I chose to go back to school to study Viticulture and Enology. They are a reminder of time spent at the educational institution I have great respect for. They are the symbol of a push toward the future of my own vineyard. My own winery. My own bliss in a bottle. Sadly, I will never taste these wines. Well, let me clarify that. I will never taste these wines again. I have experienced these wines during their fermentation phase and again under sensory analysis conditions. Never with a meal. Never socially. Only educationally. These wines were bottled to be used only for educational purposes in enology study and given to the students who took part in making them; UC Davis is not a bonded winery and cannot sell their wines for profit. These wines were given to us before a Thanksgiving holiday along with instruction to come back with a sensory review. I could not get myself to open them. They were too sentimental to me. How silly I know but if I opened them, I would no longer have the first wine I took part in making. People save their first dollar, why not their first bottles of wine. For me it’s not just about what’s in the bottle. It does not matter if the wine is good or bad. What matters to me is who was next to me when we crushed these grapes, pumped the juice into the tanks, washed out the bins and cleaned the hoses. Yes, it was a small moment in time, in comparison to the scheme of my life. But looking back it was a very poignant moment. Mostly for what it took for me to get there. So these bottles will forever remain shut. Cork in. One day I will build a shelf in my winery and place them there for everyone to see. There is no price tag on these wines; they are priceless. I reminisce about the times that were as hard as they were enjoyable, but always fun. Are there any wines that make you sentimental? I hope the Viticulture studying is going well and I hope you get that winery one day! As for sentimental wines, I picked up some brunellos while honeymooning in Italy, but I’ve never been able to bring myself to open them. 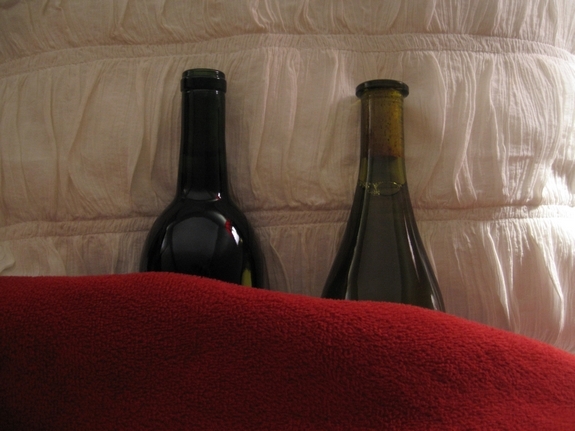 I know they’ll be great, but is the occasion really honeymoon-wine-worthy? Also, that last photo is hilarious! Right now I have three cases of wine sitting in my office at work. They’re for my bosses retirement party. He’s very particular about his wine. I bought them from his daughter in law who works for Columbia Distributing. I’ll feel very sentimental if he likes them! I want him to be happy! I like the story of your wines! Unfortunatelyâ€¦. no, I am afraid that I simply do not have the taste for wine. This yearâ€™s resolution however, is to acquire the taste for it. So maybe by the end of the Year, I will have attained a sentimental wine. I drank a bottle of wine last week. Yep, me….all by myself. It was one of those weeks. You should be proud of me!!! I’m not the expert you are but I did venture out of the box some!!! I wouldn’t open those either. How cool! I have 2 very sentimental bottles that will never be drunk. One, the bottle that my husband used to propose. He made his own label and wrote a story of our relationship on the back, which culminated in a marriage proposal. The second, is a bottle of my dad’s homemade wine. The label is a picture of him, harvesting his grapes. Both of these have more sentimental value than the wine inside. I wish I had a wine I was sentimental about, but I don’t. The closest I can come is the McMurray Pinot Noir. My husband and I got a bottle of it at dinner once and we asked our waiter “McMurray…as in…?” and he said “Yes, Fred McMurray of My Three Sons.” That just made us laugh so hard, so every time I see it I buy a bottle just for that reason. And I can’t believe you’ve got a picture of them lying down in a bed. OMG. You’re right. You should never open these bottles. I agree with you there. Sonoma Cutrere is the only wine (so far in my life) in which I feel a sentimental tug on my heartstrings. It’s a long boring story. And I really don’t know all that much about wine. Girl. You crack me up… or make me weep. or both. Veuve Clique Champagne makes me sentimental. My husband buys a bottle every year for us to share on Christmas Eve while we are wrapping gifts late at night. He bought a bottle when the last of the four sous chefs were potty trained. Yes, it was that big of a deal! I hope you never open those bottles. It’s a good memento of your dreams and how far those two bottles have taken you in your quest. I have one bottle left from a trip I took to France 12 years ago. Since then my good friend who took us to his best friends winery outside Saumur for an afternoon in the cellar has passed away. All I have left are great memories, photos and this one bottle of wine. I will never open it! Thank goodness this was before 9/1/1 as I brought home 18 bottles of wine in our carry-on luggage! A trip for the books!